getcalc.com's Geometric Progression (GP) Calculator is an online basic math function tool to calculate the sum of n numbers or series of numbers that having a common ratio between consecutive terms. Geometric Progression often abbreviated as GP in mathematics, is a basic mathemetic function represents the series of numbers or n numbers that having a common ratio between consecutive terms. For example, 2, 4, 8, 16 .... n is a geometric progression series that represents a, ar, ar2, ar3 .... ar(n-1); where 2 is a first term a, the common ratio r is 3 and the total number of terms n is 10. Therefore, the sum of above GP series is 2 + (2 x 3) + (2 x 32) + (2 x 33) + .... + (2 x 3(10-1)) = 59,048 and the Nth term is 39,366. 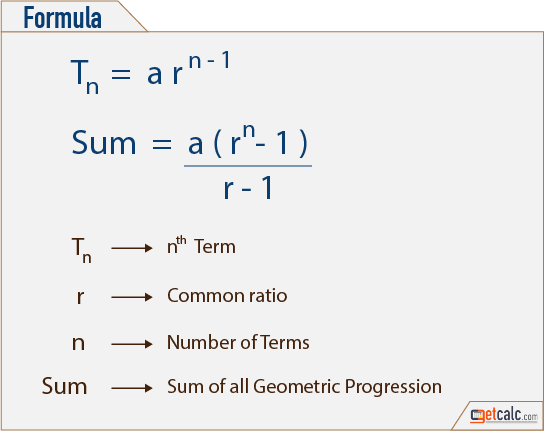 It's very useful in mathematics to find the sum of large series of numbers that follows geometric progression.